In golf, hitting it longer does help. However, every year companies come out with new clubs claiming they are longer. Too good to be really longer? Unfortunately, you can’t always test clubs under the same conditions as the advertising claims. Or maybe you can. Do the claims hold true for your game even if you aren’t a tour player who swings at 115 mph? I decided to separate the spin rate from the roll, and I was going to test this out, as I don’t swing at that speed, at least any more. It’s one thing to get the robot launcher to get more distance, how about with a real human, like me? 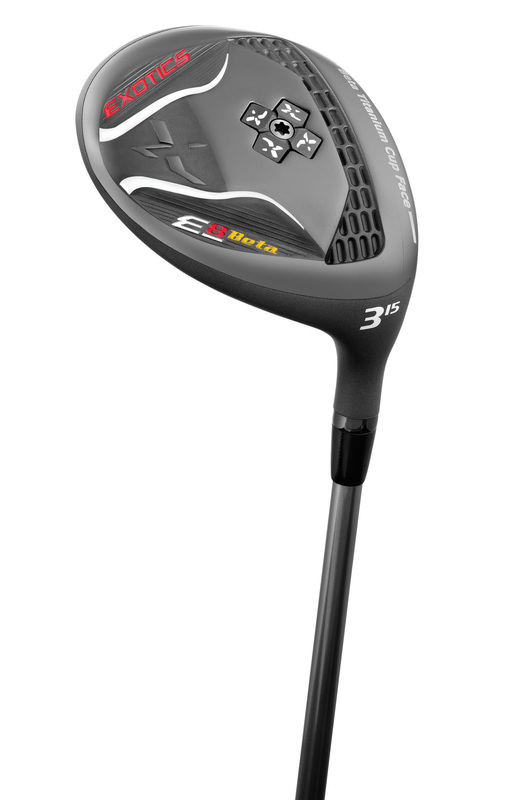 The Tour Edge Exotics E8 is advertised to be anywhere from 15-25 yards longer in a 3-wood compared to the competition. I am in the market for a new 3 rocket, so this caught my attention. I went to the Tour Edge website to read about how they did the test. They had all clubs tested at 110 mph, and my swing is realistically 90-97, so faster than average, but no match for the robot. However, my short game is better than his. Would I get the same distance advantage even if my current 3 wood, a Nike that I like is only two years old? Tour Edge touts the E8 Beta has an improved, slightly smaller head shape based on tour player feedback. It is slightly deeper in the face to theoretically produce a slightly lower, more penetrating trajectory and improved performance from the tee box. The smaller club head size moves the center of gravity to move closer to the face for trajectory control and low spin ideal for players with higher swing speeds. I am not super-fast in that department, but definitely above average. Couple their face geometry with a titanium cup face combined to the steel body, and theoretically my 3 Wood could launch Super Man. The regular E8 is steel, and a little more forgiving according to their press material and website, but still a distance experience. The moment of truth occurred at a local golf retailer who stocks all the clubs, and was quite happy like most to let me launch and measure, hopefully creating a sale. I get warmed up with 10 swings. Let the distance comparison begin. All clubs are 3 woods, 15 degrees with regular shafts. I test my Nike with an equal new Cobra Fly Z and the Tour Edge, in both E8 and E8 Beta. The chips might fall where they may, but I am more concerned about the golf ball in this case. I hit the Nike well, and after 10 swings, we establish my baseline distance. Let’s call it X. I then rotate through the new Cobra and the Tour Edge models. Just for fun, I also test the Tour Edge in the strong 4 wood just to see the numbers. No 110 mph swing, just my consistent 90-97. I test off the deck, no tee because I am concerned about fairway performance. With the Nike, I was consistently at X distance. The Cobra was another 12 yards further than X, so good news there. So far, technology appears to match the hype. The big surprise is both the Tour Edge 3 woods are 17 and 19 yards past X, just about every time. The E8 was easy to hit, yet the E8 Beta was a little further and had the same dispersion, in this case basically straight. Interestingly enough, the strong 4 wood in the E8 Beta was the same distance as the 3 wood, just with more airtime. Just add to water, instant optimal electrolytes for golf! Golf is played in warm temperatures for an extended duration, so hydration over the course of a round is more important than for sports of shorter periods in cooler temperatures. When you travel, you are likely to drink less water than normal for a variety of reasons. Unfortunately too little water and you will play poorly. So just how much water do you need? Are sport recovery drinks better than water? The BMW Championship held in Denver this last year gave a peak about how tour professionals view hydration. Hunter Mahan, in his interview, noted he “knows hydration is important at altitude,” but did not have a concrete plan in place. Golf is a different activity than what we usually think of in terms of hydration having a definite impact. Television commercials showing the bright-colored electrolytes oozing from a sweat-drenched athlete is not quite the real deal in golf. And, not surprisingly, there has been no research specifically on golf and hydration. We have to combine some factors from golf performance with any research on similar things, like walking or marching in the heat. Golf is about five miles of walking at an average pace of 2.6-2.9 mph and uses anywhere from 800-1500 kcal per 18 holes depending upon if you walk or ride. And, that is over a 4.5 hour period. The hotter it gets, the longer the round, and the more ups and downs of the terrain, the more accurate hydration strategies become necessary for golf performance. Hydration research tends to show that moderate or greater levels of dehydration influence two of the biggest contributors to golf performance: cognitive/thinking skills and coordination. So, it may be more important to maintain fluids not because of strength or aerobic performance, which do have some bearing on golf, but rather so you stay focused and can execute the shots you want. The research is mixed on whether sports drinks versus water are best. A few studies using soldiers had varying results showing long marches had very little difference between water and various sports drinks in promoting hydration. It might be that the more intense the activity with a higher rate of sweat, then the sports drinks have more value for getting fluid back into the system. The question is how you play golf and does that necessitate having two of the “green ones” during a round versus water. On that note, a count of the types of beverages consumed during at stretch of the BMW revealed the players about 90% of the time used plain water. Interestingly enough, golf is probably an activity where the lessened calorie and electrolyte drinks, the “light” versions have the best applicability, at least during the last 9-12 holes. One commercial product, Nuun, is simply a flavored electrolyte pill added to water, a simple solution if you need hydration and electrolytes and not necessarily additional fuel. A safe amount of initial fluid intake is one-half your body weight in pounds equaled to ounces. So, if you weigh 200 pounds, then you should have about 100 ounces of fluid a day. If it’s hot, and you are sweating more than normal, this will likely go up by 20-70%. You should take in 25% of your daily total by 9 a.m., and another 40% by 1 p.m. to be safe in terms of not starting a round de-hydrated. Having a hydration plan starts with BPA free bottle, mark with 3-6 ounce marks, and refill as needed to get 25% of your total water needs during the round. Then just pick the holes where you need to drink that amount of fluid. Every three holes is an optimal schedule for most golfers. Experiment on what you can tolerate, and then stick to specific hydration/beverage strategies. Try various fluids such as water, sports drinks or electrolyte solutions like Nuun. Most regular sport beverages are too concentrated in both sugar/energy and electrolytes to be readily absorbed, so diluting down with water 2:1 or using a lighter concentration is advisable so the body will absorb the nutrients rather than send fluid to the stomach to dilute the concentration. It also helps to have a reasonable day plan and then one for more hilly courses in the heat, that way it’s easy to note that plan B requires 20% more fluid and little more energy. There are some sports beverages on the market with caffeine as well as electrolytes. For many golfers, caffeine is a great pick me up but has diuretic tendencies, or you loose water. If you are going to use one of these compounds, then make sure it’s over the last 4-5 holes where any potential loss of water will occur after the round.